It seems like decades ago, in fact it was decades ago - when Sir Richard Greenbury was in charge of M&S in the late 1990s and profits hit £1bn before tumbling away - that commentators first started poring over its results and asking: "What are they going to do to sort out their clothing?". And no-one, apart perhaps briefly Sir Stuart Rose, has succeeded in finding an answer. But what if there actually is no way of "sorting out" its presence in this market and going back to its heyday? The problem is that the mass middle market that M&S served in days gone by is fragmenting. This is demonstrated by the heat map of clothing and footwear spend above, looking at how much it grew in percent between 2010 and 2015. 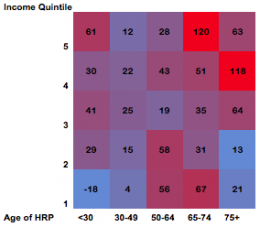 The squares represent groups of households by age of the head of the household (HRP) and by income level, with the 'hot' areas showing highest growth and the 'cold' areas the least. So what does it show? The fastest growth overall is mostly among the over-50s, with hotspots among the poorest 50-74s and richest over-65s, as well as among the better off under-30s. Unfortunately, the 30-49s, the key family audience M&S used to serve has seen slower than average growth and much of this has been snapped up by arch-rival Next. It has tried to create ranges that will keep both the young fashionistas and the older, wealthier customers happy, but has mostly fallen between these two stools in terms of style, fit and quality. In the end it will be forced, by the shrinking of its non-food business, to jump one way or the other, but it will not be an easy decision to make and whichever way it goes, it will leave a substantial part of its old audience feeling disgruntled. In short, far as M&S's fashion halcyon days are concerned, there is no way back.